Forrás: Daily Mail. Szerző: Nick Enoch. 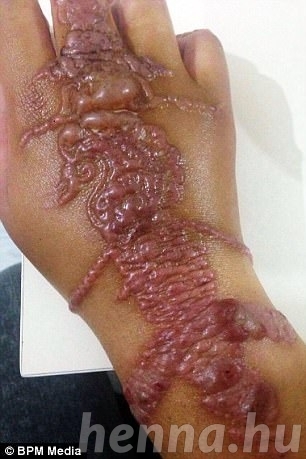 A young woman suffered a horrific reaction which left her hands swollen and ‘blistered’ after getting a ‘black henna’ tattoo on holiday. Sophie Akis decided to have the temporary tattoo after being approached by a street vendor on the beach during a holiday with her family in the seaside resort of Agadir, in Morocco. The 22-year-old, who was on holiday with her husband and other relatives, even opted to have her skin tested and waited 24 hours before paying the equivalent of £4 for the popular temporary inking. Wendy, a housekeeper from Yardley Wood, Birmingham, said within hours her daughter ‘was in a mess’ with her hands swollen and ‘blistered’. 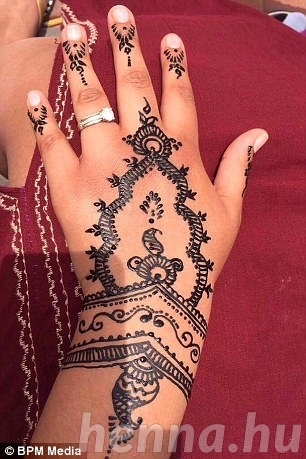 She continued: ‘We are a large Asian family so Sophie has often had henna tattoos for weddings when in this country and has been fine, but we took the precaution of having a test first in Morocco. ‘Sophie reacted badly to hair dyes when she was younger so I wanted to be sure. ‘We waited 24 hours and then she had the henna done on the tops of both hands. Within hours she was in a mess. Her hands were swollen and blistered. Wendy, 56, said that as soon as her daughter and husband landed in Turkey where the couple now live, they went straight to their local hospital. Doctors there said it was an allergic reaction and gave the distressed patient an iodine solution to bathe her hands in every 10 minutes for two days as well as a cortisone cream. ‘She is still in a lot of pain,’ said Wendy. ‘I feel terrible for her. 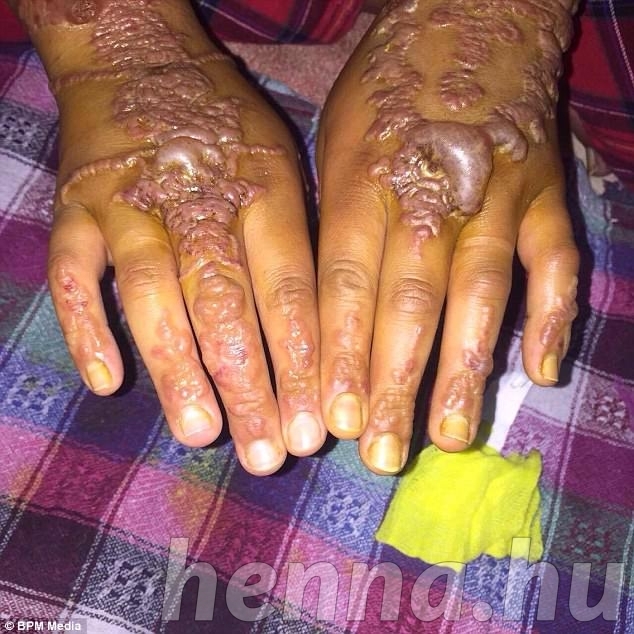 The mother-of-four urged those travelling abroad to think twice before opting for the inkings which in many cases are not henna at all, but a substance called paraphenylenediamine which can cause blistering, painful skin burns and may even lead to scarring. 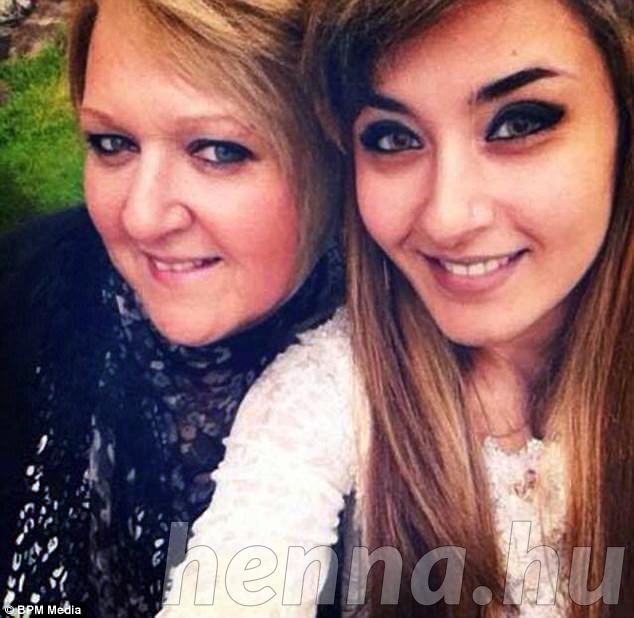 The British Skin Foundation has launched a campaign to #AvoidBlackHenna as summer approaches. Atomic Kitten star Natasha Hamilton is backing a British Skin Foundation campaign to #AvoidBlackHenna as summer approaches. 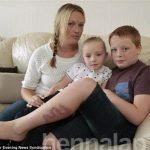 Upon returning from a holiday in Morocco, her son Alfie aged six was left with a scar on his leg where the tattoo had been.